It's the final day on the Hensies Canal. 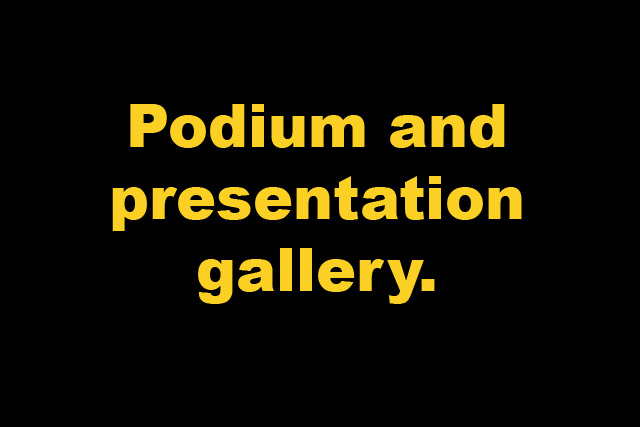 With only 12 points separating seven teams, there was still podium places for everyone to play for. But things would become different this day, as over half these teams would fall—in some cases quite drastically—away from that glory. With cloud and rain forecast as the day wore on, we would also see the emergence of the two main candidates for gold, although it would still seem confused, due once more to the overall nature of fish dispersal! We shall therefore try to focus a little more on these two particular teams… England and Russia. Both England and Russia employed differing feed mixes. England on day one had used a mix of Sensas Black Lake (20%), Terre de Somme Noir (70%) and Terre de Riviere (10%) but realised that they had created a heavy mix, whereas France had used a much softer mix, which broke up as it hit and fell through the water. They changed this for day two by using mainly damp leam with a little Black Lake and added plenty of joker, bloodworm, chopped worm and caster. 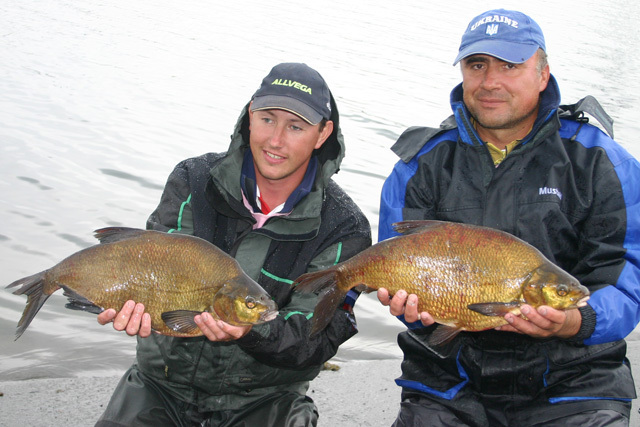 Russia’s mix was more groundbait dominant, which may have accounted for bream in their catches. This was made up of 2kgs Sensas Super Black Bremes, 1kg Sensas Super Black canal, 1kg Sensas Super Breme and a few kilos of Terre de Somme. To this was also added Belgian Brasem. As an observer, watching competitors sitting waiting for bites and then actually being there when something comes to the net is quite difficult and frustrating. Seeing lots of fish being caught creates action throughout the day and focuses the mind, unlike walking countless hundreds of metres looking for any signs of bent rod! Russia's Sergey Fedorov strikes into another good fish, on his way to a superb section win with 12,892kgs. Russia's Sergey Fedorov strikes into another good fish, on his way to a superb section win with 12,892kgs. The Czech Republic held a 2 point lead going into the final day but lost it with three bad results. 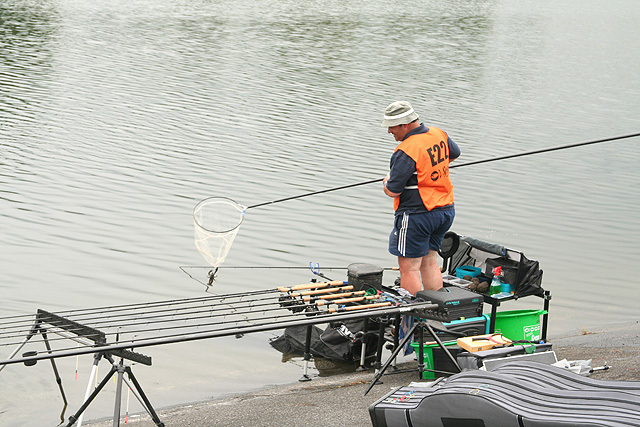 Here Ondrej Pokorny nets a bonus bream which gave him a 4th in section, his team second best score on the final day. The Czech Republic held a 2 point lead going into the final day but lost it with three bad results. 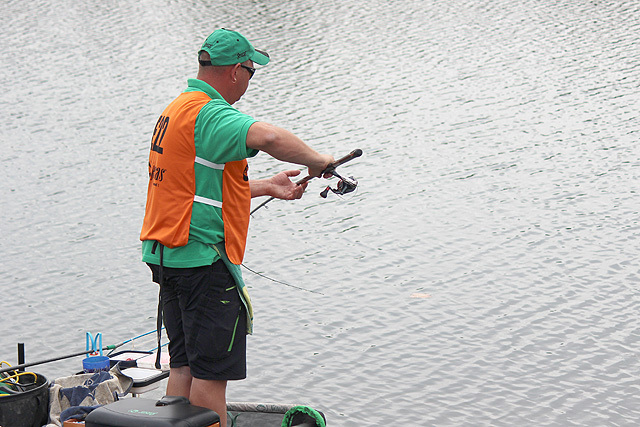 Here Ondrej Pokorny nets a bonus bream which gave him a 4th in section, his team second best score on the final day. 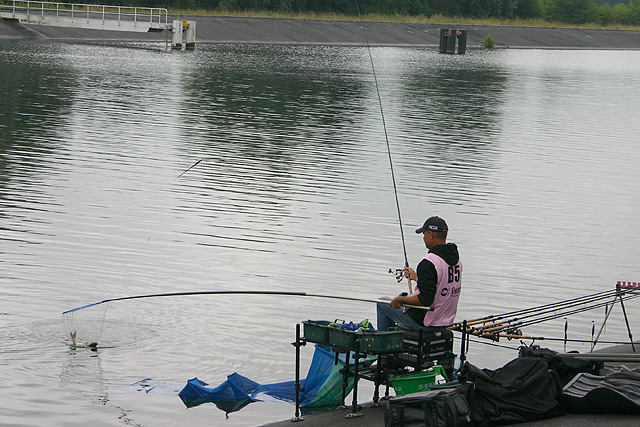 It's a long reach to this fish, but Holland's Arjan Klop makes no mistake getting it in. His team did not have the championship they wished for, however, Arjan was one of their top scorers with a 4th and 7th over the two days. 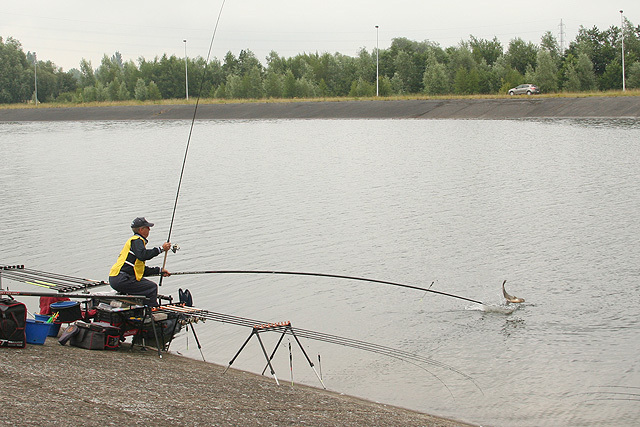 It's a long reach to this fish, but Holland's Arjan Klop makes no mistake getting it in. His team did not have the championship they wished for, however, Arjan was one of their top scorers with a 4th and 7th over the two days. This good fish helped Arjan to a final days weight of 2,860kgs and 7th in section. This good fish helped Arjan to a final days weight of 2,860kgs and 7th in section. Yury Siptsov was Russia's top scorer and narrowly missed out on what would have been a well deserved medal. 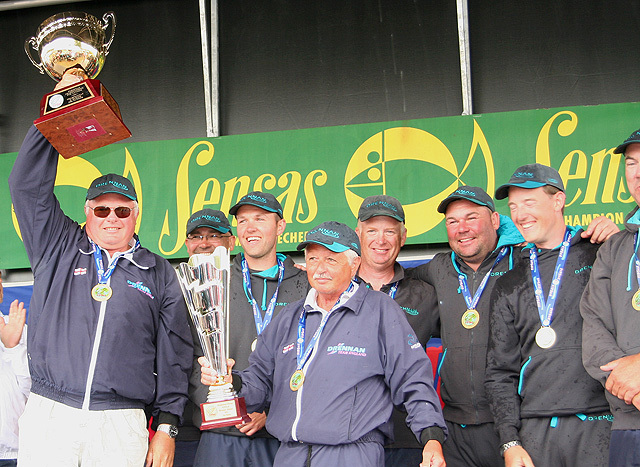 His overall score of 5 points and 16,402kgs was the fourth behind two of his team mates and Mike Thinnes! Yury Siptsov was Russia's top scorer and narrowly missed out on what would have been a well deserved medal. 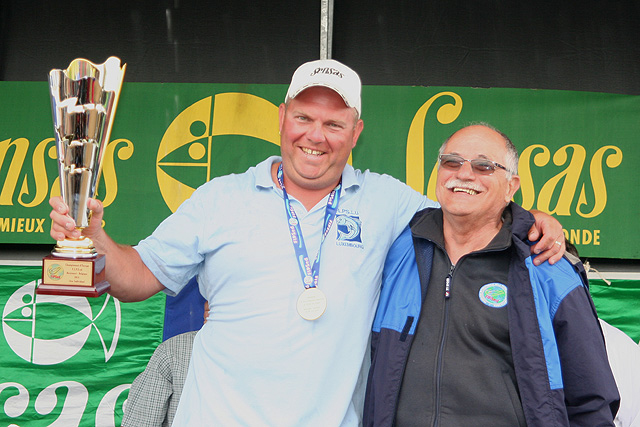 His overall score of 5 points and 16,402kgs was the fourth behind two of his team mates and Mike Thinnes! 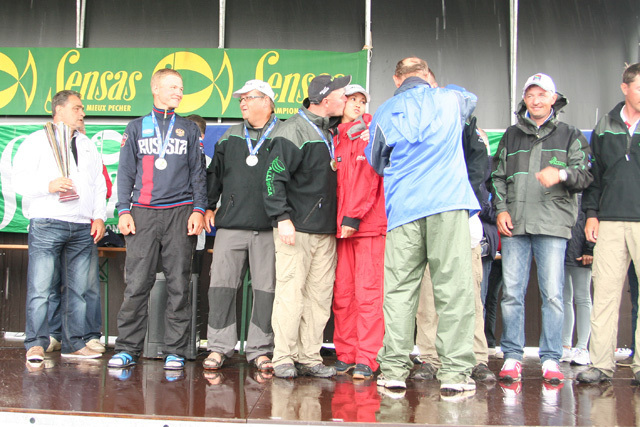 One of Hungary's top anglers, Jozsef Varga, had a successful tournament, unlike his team. Jozef's weight of 8,067kgs was second best to Yury Siptsov and gave him an overall total of 5pts, again he was behind Yury! 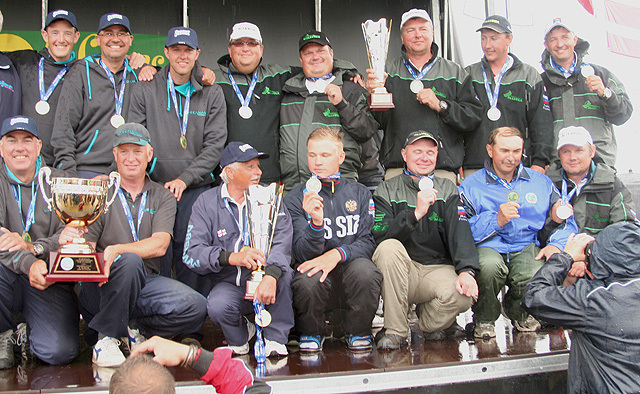 One of Hungary's top anglers, Jozsef Varga, had a successful tournament, unlike his team. Jozef's weight of 8,067kgs was second best to Yury Siptsov and gave him an overall total of 5pts, again he was behind Yury! 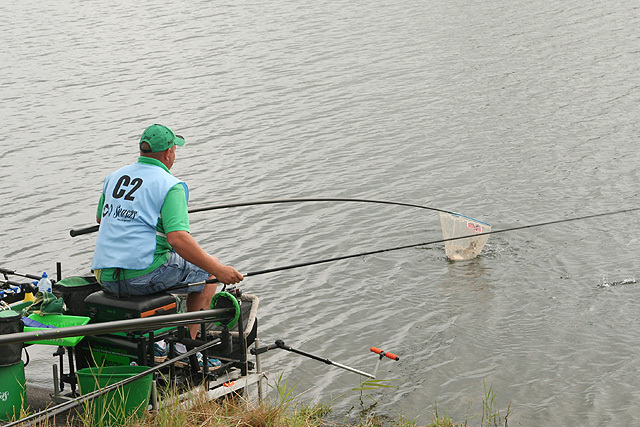 Geert Jacobs nets a good fish, but it only gave him a 9th in section. 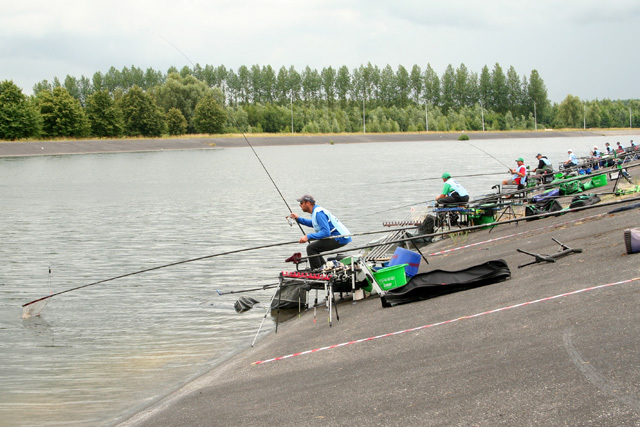 It was a disappointing championship for Belgium and their individual anglers, who must have thought that they stood some chance of making it a seventh winning Euro Champs. 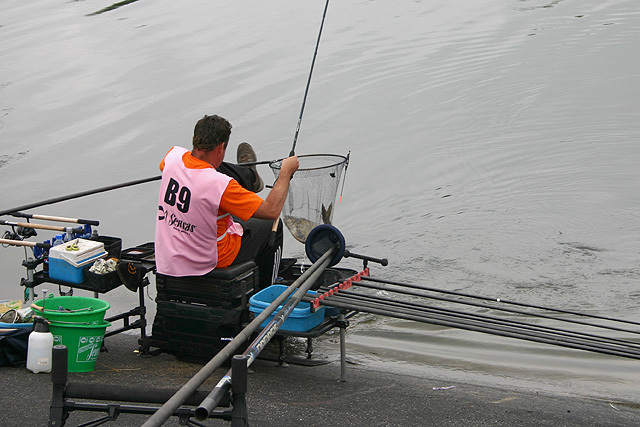 Geert Jacobs nets a good fish, but it only gave him a 9th in section. 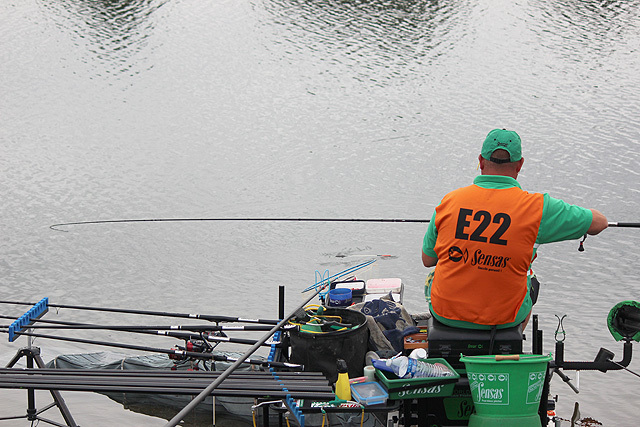 It was a disappointing championship for Belgium and their individual anglers, who must have thought that they stood some chance of making it a seventh winning Euro Champs. Callum Dicks is becoming a great asset to England since his inclusion in the Euro squad last year. He has a stiffer target to make this September in Croatia, but I'm sure he'll become a regular name on the team sheet over the coming years. Callum Dicks is becoming a great asset to England since his inclusion in the Euro squad last year. He has a stiffer target to make this September in Croatia, but I'm sure he'll become a regular name on the team sheet over the coming years. Callum nets one of his three bream on the final day to give him a 3rd in section and an overall points total of 9 for a final 11th placing. Callum nets one of his three bream on the final day to give him a 3rd in section and an overall points total of 9 for a final 11th placing. Callum looks back as his runnner briefs him on other scores in the section. Callum looks back as his runnner briefs him on other scores in the section. 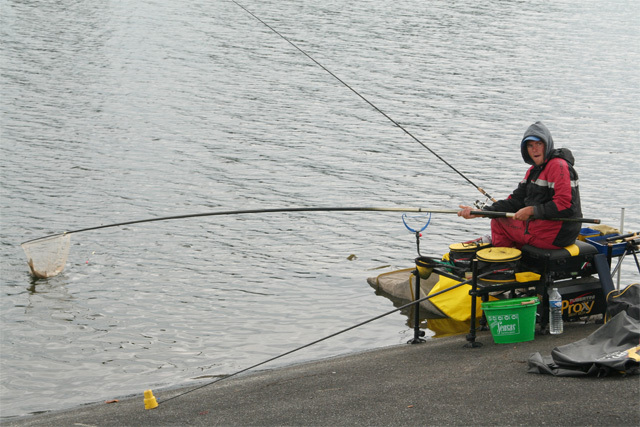 The moment of truth for Callum as he tips his catch into the weigh net. He knows Hungary's Varga has beaten him and another yet to weigh who will also, but can he secure 3rd... yes, 5,179kgs puts him just above Frenchman Laurent Voose's 4,797kgs! 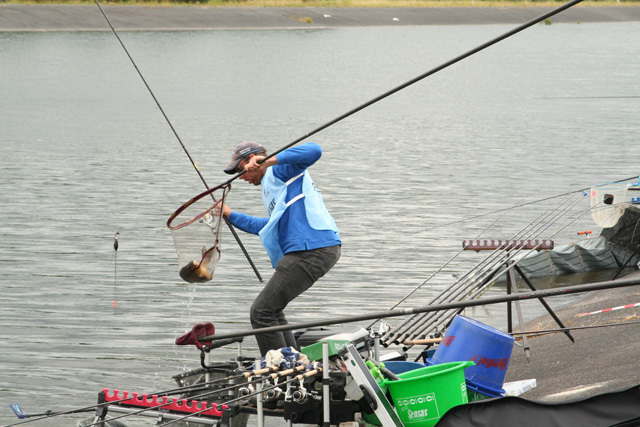 The moment of truth for Callum as he tips his catch into the weigh net. He knows Hungary's Varga has beaten him and another yet to weigh who will also, but can he secure 3rd... yes, 5,179kgs puts him just above Frenchman Laurent Voose's 4,797kgs! 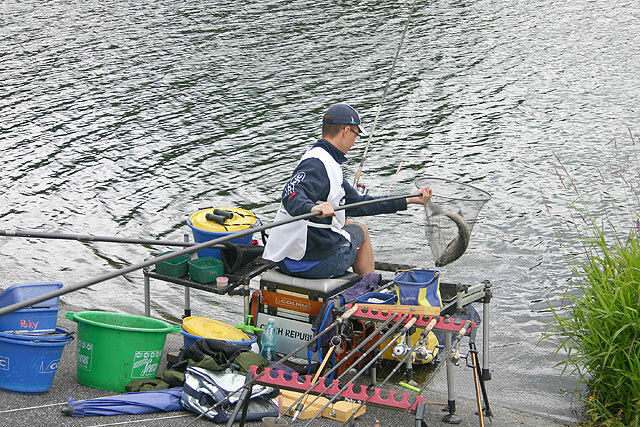 Three good fish for over 5 kilos and 3 section points to help his team secure gold. 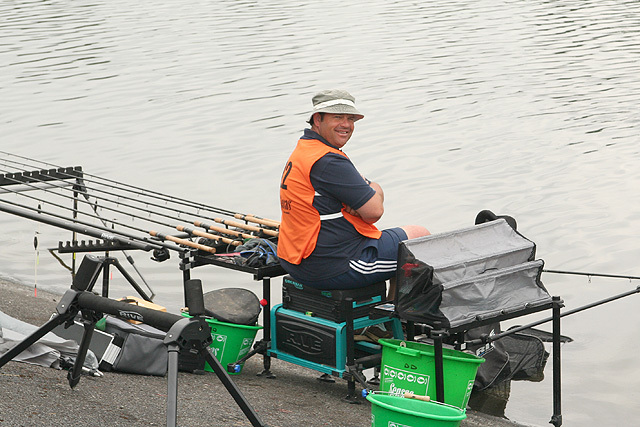 Three good fish for over 5 kilos and 3 section points to help his team secure gold. Sergey Fedorov weighs in another section win for Russia and places him in overall 7th place. Sergey Fedorov weighs in another section win for Russia and places him in overall 7th place. 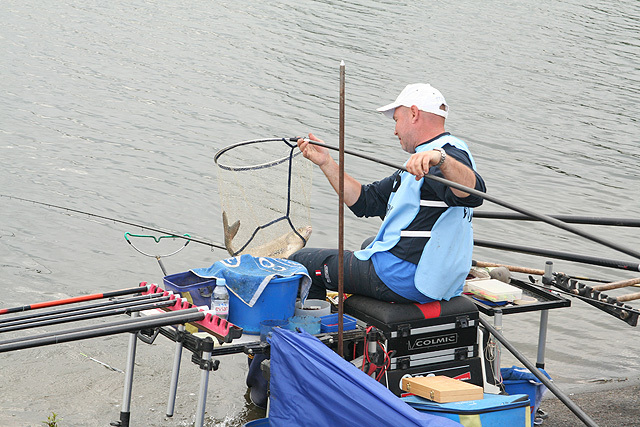 England's Simon Willsmore's final fish, the smaller of the trio, gave him a valuable place advantage over Belgium's Geert Jacobs. This was Englands last caught fish and effectively added that final point to England's overall score. 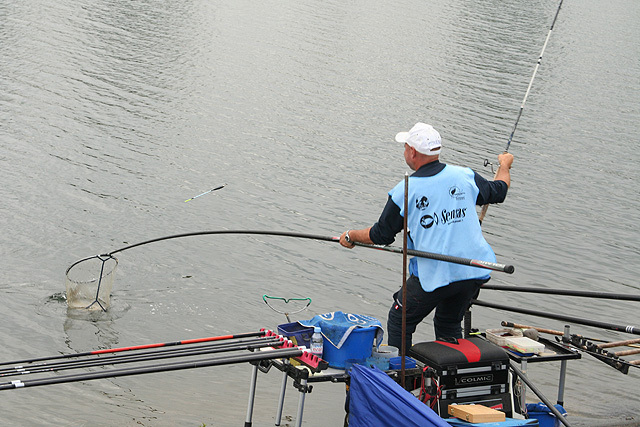 England's Simon Willsmore's final fish, the smaller of the trio, gave him a valuable place advantage over Belgium's Geert Jacobs. This was Englands last caught fish and effectively added that final point to England's overall score. Here's a photo which needs little comment... Russia's Yury Siptsov and Ukraine's Sergii Burdak. Why can't this happen elsewhere? Here's a photo which needs little comment... Russia's Yury Siptsov and Ukraine's Sergii Burdak. Why can't this happen elsewhere? The day continued to look rather poor as the hours went by, as many competitors where simply not catching any of those all important bream. There were a few notable exceptions, such as Sergey Fedorov, Yury Siptsov, Mike Thinnes and Ramon Pasmans, each would record double figure catches on a day which saw an overall drop in weights. One of these would take the gold individual. 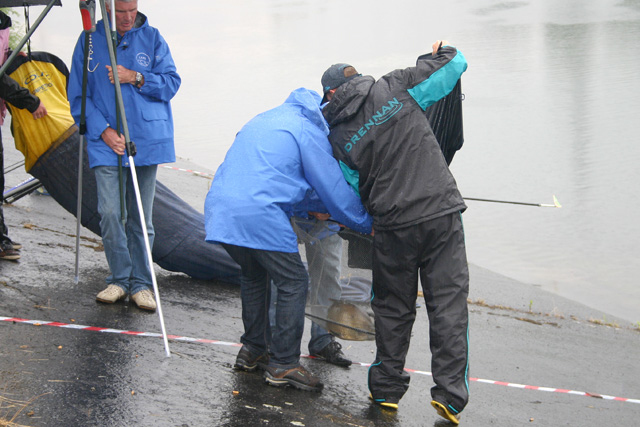 In comparison, day one recorded nearly 332 kilos of fish, yet day two would only muster just over 192 kilos. Such was the up and down nature of the venue during the championships. Where have all the bream gone? Throughout the day runners where reporting back that some of their anglers where not making any contact with bonus bream, in fact some competitors seemed so disheartened that they resorted to scratching with the pole for anything that swam near their bait! The only team that seemed to have more success than most was Russia. 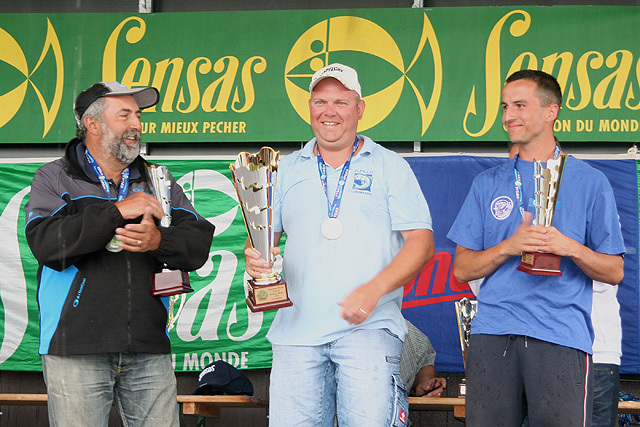 Their only problem was that two of the team could not catch a bream, one of which was day 1 debutant and section winner Sergey Komorov! It showed just how this venue was treating everyone…no one’s reputation was exempt from this situation, as we shall record later. The beginning of C section where Mike Thinnes (standing) drew one from the end peg. This was one of the two best sections to be in on a day which saw weights fall in general.England where having similar problems, again with two anglers, and what was more weird was that they where in the same section as the two Russians! Even so, England still had major problems in the other sections, even though they had caught bonus fish. They were simply not heavy enough to take them higher in the section. The only solid result that the team were having was in section B, where one of England’s rising stars, Callum Dicks, was holding his own in the top half. Things where not looking very encouraging with around 45 minutes left on the clock. But then the heavens open up and we were treated to a truly tropical downpour, which saw many observers, myself included, run for cover. It was during and shortly after this that England’s fortunes turned for the better. Storm clouds gather over two world champions fighting for points on a day which saw many reputations dented! 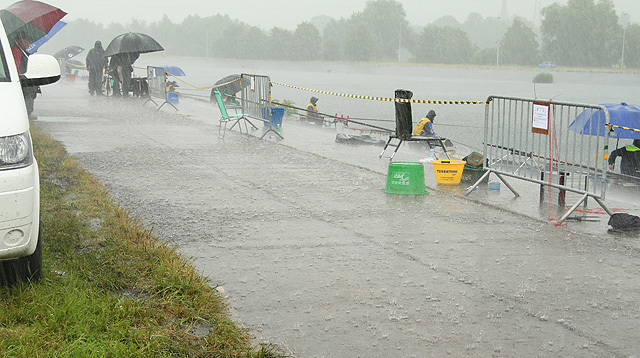 Alan was first to net a second bream, of nearly 2 kilos, while this rainstorm was in full flow. William followed suit with one topping 1.5 kilo with around 20 minutes left. But things were still not secure. Sean was sitting helpless, but with just 11 minutes left his float dipped and he was into an almost priceless fish, which sent him spiralling up the section. If this did not seem enough, their was yet one more key to be turned in the lock, and that concerned Simon Willsmore in A section. 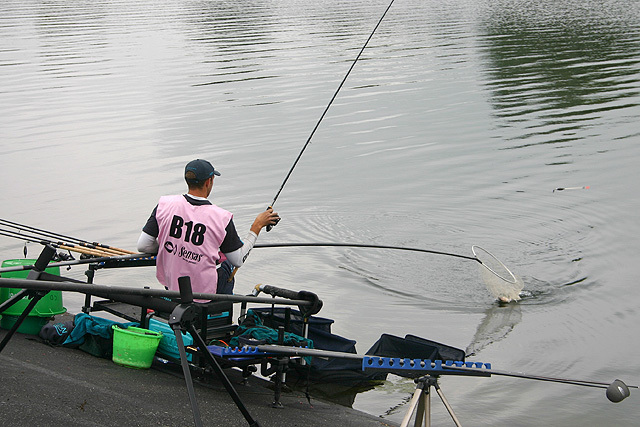 Simon had been struggling to pick up more bonus fish, but still looked to be in the sections top ten. With little time left he decided to top up once more using the soft mix England had learnt from the French the day before. Straight away Simon had indications that fish had moved onto his feed by missing four bites! 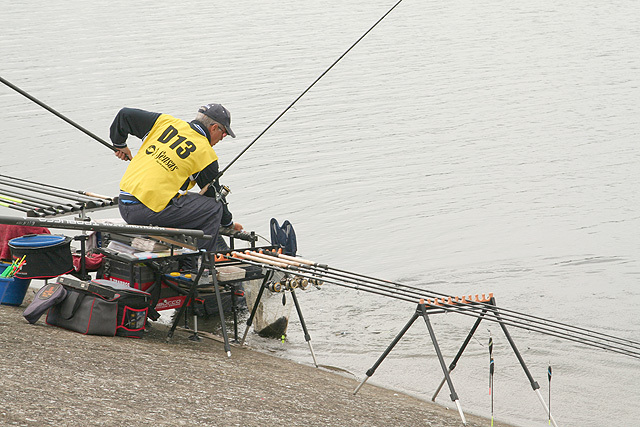 Fortunately, he managed to hit the fifth one and landed a bream of around 750 grams, which placed him above Belgiums Geert Jacobs by 145gr, effectively adding a point to England’s score. This was one of four other events in the England match that proved crucial in the final analysis! Two world champions side by side, Will Raison and Didier Delannoy, prepare for battle before the start of the final day. Two world champions side by side, Will Raison and Didier Delannoy, prepare for battle before the start of the final day. Didier caught first in his landing net, down at the side before the whistle, but it was a small crayfish. It looked heavier than Didier's final catch though! Didier caught first in his landing net, down at the side before the whistle, but it was a small crayfish. It looked heavier than Didier's final catch though! Didier waits contently and somewhat unsuspectingly for the start of what will become a nightmare day! Didier waits contently and somewhat unsuspectingly for the start of what will become a nightmare day! Spain's Jonathan Ferrer Sanchez looks a little surprised to net this bonus bream. It effectively sent him from 'zero to hero' and gave him 5th in section. Spain's Jonathan Ferrer Sanchez looks a little surprised to net this bonus bream. It effectively sent him from 'zero to hero' and gave him 5th in section. 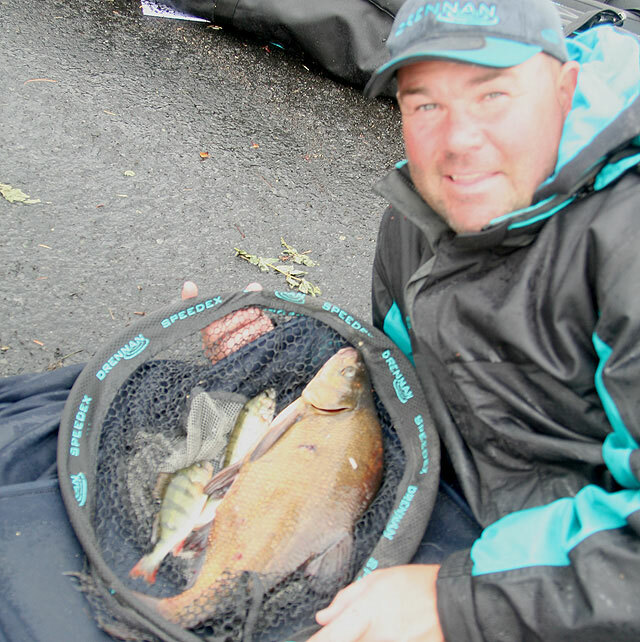 Dutchman Ramon Pasmans just manages to net a good bream on his way to a fine 2nd place in C section. Ramon, who ran the first day, was next to eventual gold medallist Mike Thinnes. 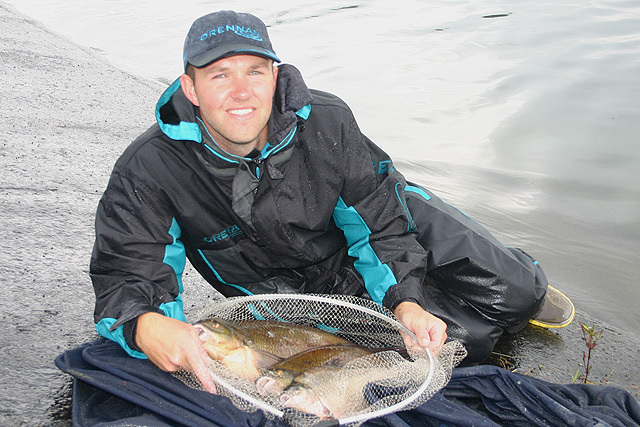 Dutchman Ramon Pasmans just manages to net a good bream on his way to a fine 2nd place in C section. Ramon, who ran the first day, was next to eventual gold medallist Mike Thinnes. It was a good sized bream for Ramon, who recorded 11,893kgs. It was a good sized bream for Ramon, who recorded 11,893kgs. 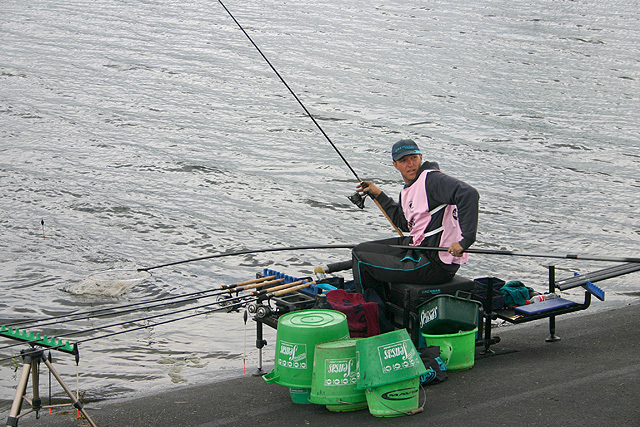 Italy's Jacopo Falsini ranks as one of the finest anglers in the world today. Italy's Jacopo Falsini ranks as one of the finest anglers in the world today. 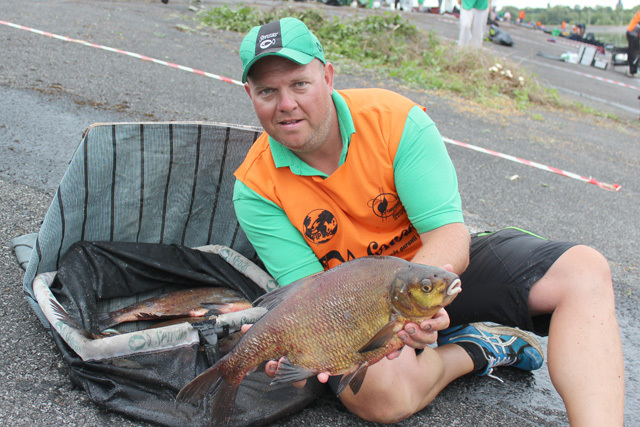 This near 2 kilo bream gave Jacopo a final days weight of 5,196kgs, enough for a 3rd in section and an overall 8th place, to help his side to a bronze medal. This near 2 kilo bream gave Jacopo a final days weight of 5,196kgs, enough for a 3rd in section and an overall 8th place, to help his side to a bronze medal. 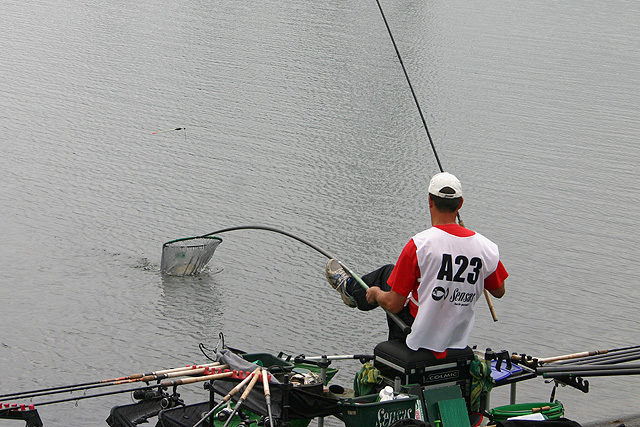 It was a poor section E on day two, but Slovakia's Radoslav Rolik secured a valuable 2nd place above Will Raison with this good fish. His team improved on a first day's low return by posting a respectable 48pts, to give tham an overall 11th out of 24 teams. It was a poor section E on day two, but Slovakia's Radoslav Rolik secured a valuable 2nd place above Will Raison with this good fish. His team improved on a first day's low return by posting a respectable 48pts, to give tham an overall 11th out of 24 teams. Italian Gianluigi Sorti almost matched his team mate Jacopo on overall scores, but would have been further behind had this bream actually jumped clear of the net! Italian Gianluigi Sorti almost matched his team mate Jacopo on overall scores, but would have been further behind had this bream actually jumped clear of the net! As it was, Gianluigi managed to get in securely in the net to weigh in 2,443kgs in what also proved to be a poor section on day two. 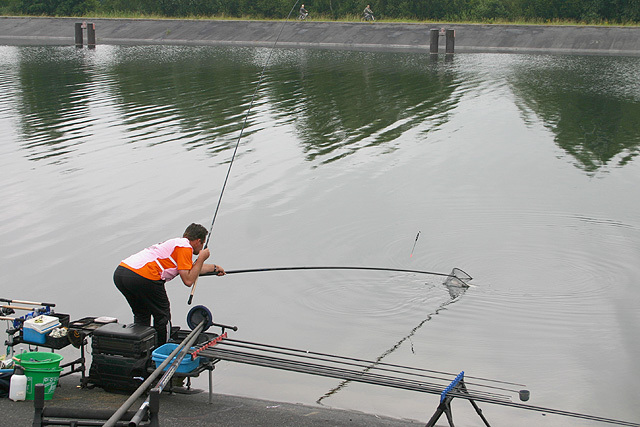 As it was, Gianluigi managed to get in securely in the net to weigh in 2,443kgs in what also proved to be a poor section on day two. It truly was a rainstorm of tropical, or even biblical proportions, but it was during this that England's fortunes turned dramatically around to seal a narrow win over Russia. It truly was a rainstorm of tropical, or even biblical proportions, but it was during this that England's fortunes turned dramatically around to seal a narrow win over Russia. 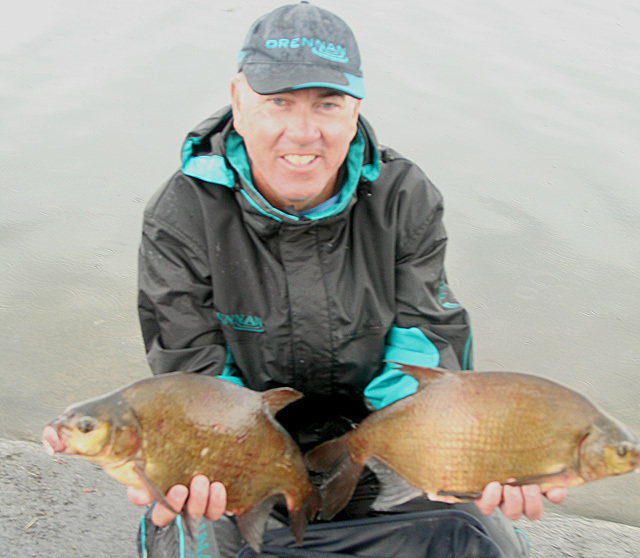 Five times World Champ Alan Scotthorne with two bream that contributed to England's success. 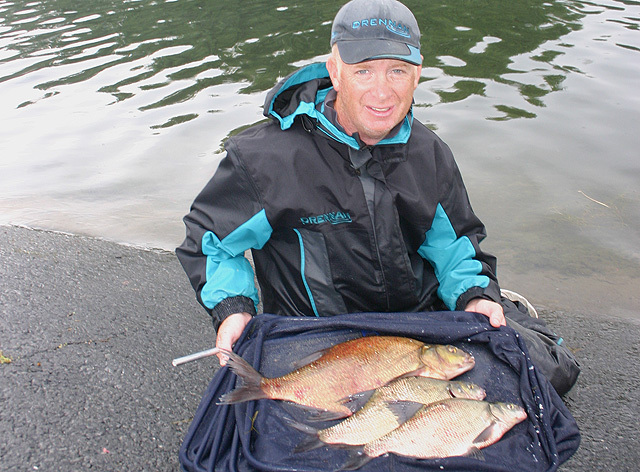 Five times World Champ Alan Scotthorne with two bream that contributed to England's success. Likewise, this 1.7kg bream shot Will up the section with 20 minutes remaining and also contributed to England's final score. Likewise, this 1.7kg bream shot Will up the section with 20 minutes remaining and also contributed to England's final score. While England’s fortunes where turning, Russia were still struggling and breamless in the final two sections. Two of the team where winning their respective sections while the third member, debutant Eugeny Gukov, was holding his own in the top half. 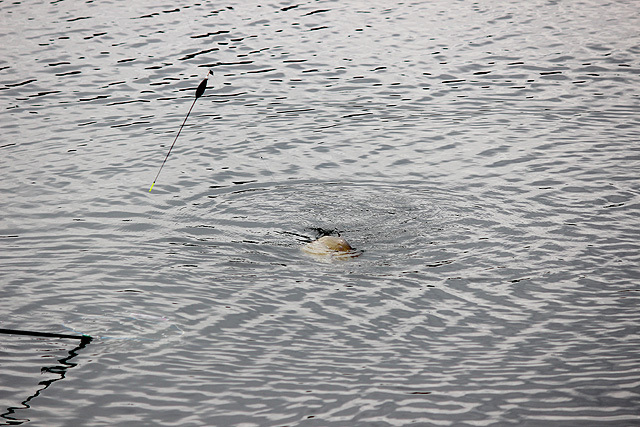 It was unclear at the final signal who had won, such was the nature of the fishing and the tight margins involved. Word had reached England that Italy where fading in their challenge and would eventually settle for bronze position. 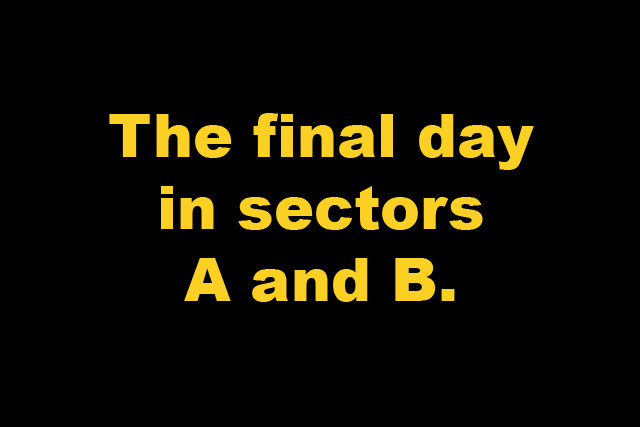 The Dutch had suffered a disaster with a disqualified fish in sector D, effectively costing them at least 6 points, which would have given them the bronze medal. Home side Belgium could not have wished, or deserved, for such a nightmare tournament, on what many believed was a golden opportunity to record a seventh European title. Their final day’s score of 51.5 points sealed their fate and position, although they did move up a place in the final team score. The Czech’s had faired much the same. From overnight leaders, they slumped to a poor 10th position on the day, which dropped them down into 5th overall. 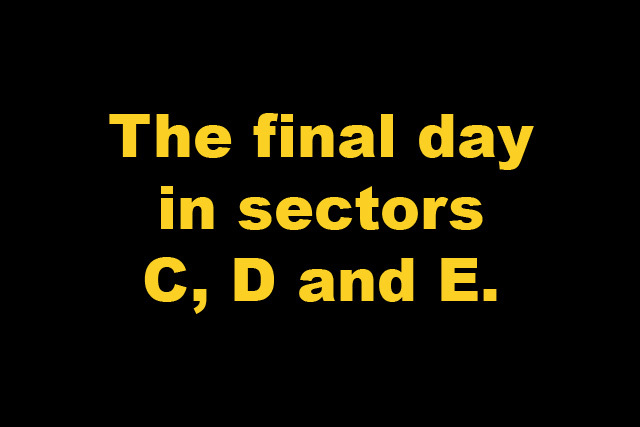 Where Did(ier) it all go wrong? Unbelievably, France produced what must rank as one of their worse day two performances in recent years, after such a magnificent first day. 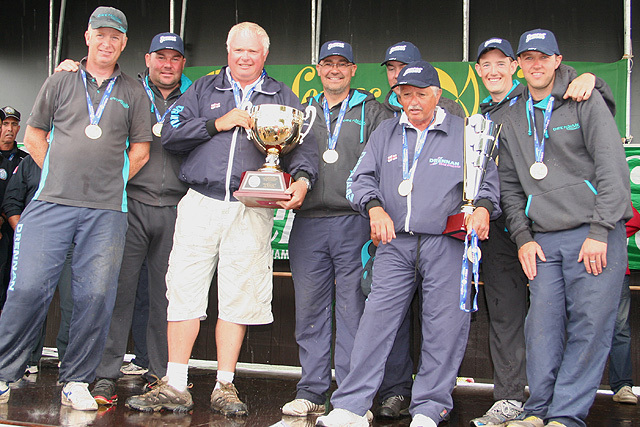 Four of their anglers only managed a bottom half finish in their respective sections. The only shining light in their championship was the superb overall performance of Diego Da Silva, who took the silver individual medal. How France will appreciate his experience and skill over the next few years. When we look into those comments further, it’s interesting to note that Saturdays weight from William’s peg was 10,119kgs, while Didier’s peg produced 12,980kgs. Such was the erratic nature of the canal over the two days. Much of it, it must be said, was in no small part due to weather conditions, as in fact it had been for the whole of practice week! Looking back over the two days, it was also clear that you needed an element of luck, which also played a significant part in results. The closeness of the top two teams actually showed a very different picture of how things went for each of them. England’s overall weight of nearly 40 kilos was 50% less than that of Russia, which to my opinion again pointed the finger squarely at the venues fickle and erratic returns. In fact England’s weight was only the 5th highest, compared to Russia’s top weight of 60,455kgs. Our top three individuals... Frenchman Diego Da Silva, Mike Thinnes of Luxembourg and Roman Pokorny jr., of the Czech Republic. Our top three individuals... Frenchman Diego Da Silva, Mike Thinnes of Luxembourg and Roman Pokorny jr., of the Czech Republic. 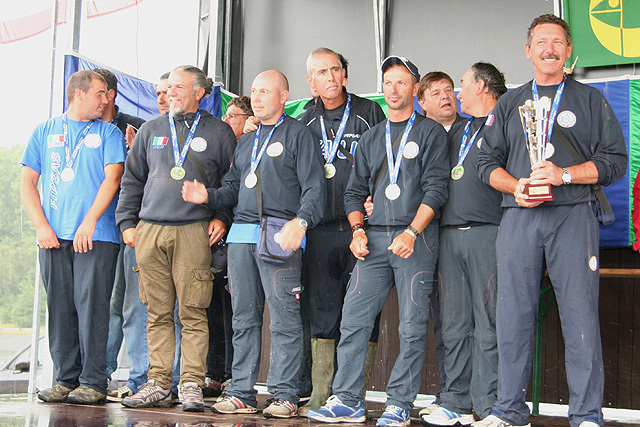 Italy, who maintained their day 1 position, took the bronze medal with a similar performance. Italy, who maintained their day 1 position, took the bronze medal with a similar performance. Russia's CIPS official Igor Chinyakov, presents the Russian team with their silver medals, while Ilya begins his own celebration! Russia's CIPS official Igor Chinyakov, presents the Russian team with their silver medals, while Ilya begins his own celebration! Yes Ilya, everyone is looking! Don't forget to share with your friend Igor behind you!!! Yes Ilya, everyone is looking! Don't forget to share with your friend Igor behind you!!! England over the moon with their gold medals and trophies, which was not looking very likely 45 minutes before the final signal. England over the moon with their gold medals and trophies, which was not looking very likely 45 minutes before the final signal. Just glad to be here. Just glad to be here. one point is pretty close! one point is pretty close! The traditional dip in venue after the presentations...minus their respective mobile phones of course! 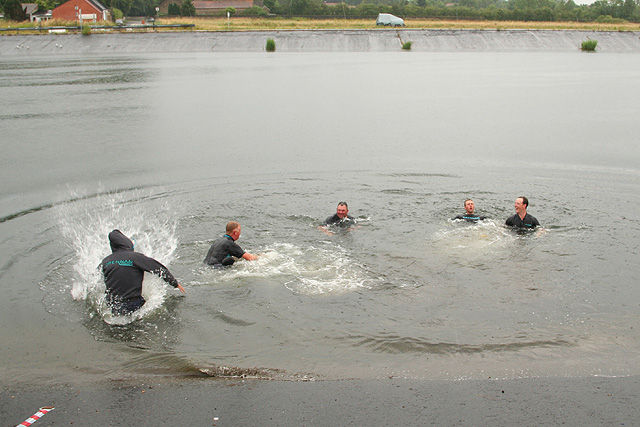 The traditional dip in venue after the presentations...minus their respective mobile phones of course! But this proved a team event of points, not weight. 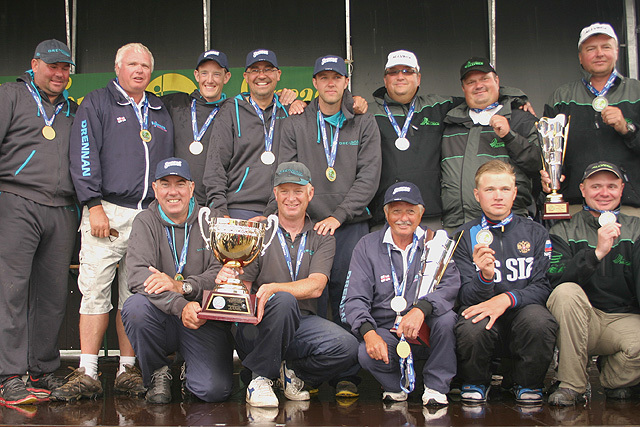 The close finish of these two teams was also testament to the differing nature of fishing. 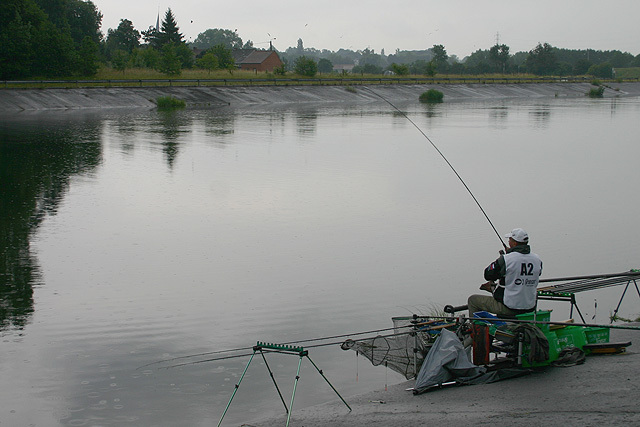 Russia had three anglers breaking into double figures over the two days, while England had none. 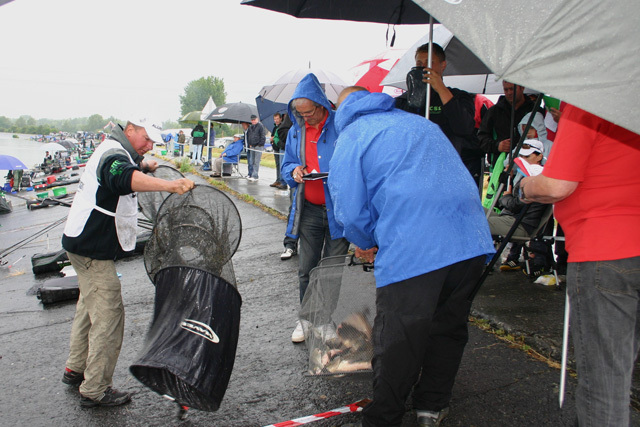 The Dutch also had three anglers recording double weights and they finished down in 4th place, 3rd place if that fish had not been disqualified! Italy, like England put in a good overall performance to take the bronze medal and, like England they didn’t have any section winners. It shows yet again that no matter how well some individuals do, it always rests on a whole teams performance over the two days, by fortune or other means! Fortune, it is said, favours the brave, and this championship certainly saw some brave performances from both England and Russia and their rewards were justly entitled. Russia, it must be said, were more than happy to run England that close and beat Italy. They are dedicated, highly skilled and well supported by their sponsors, but more importantly they are still growing in experience. Looking ahead at the calendars future internationals, they may well become a force to reckon with. Overall, the Hensies Canal looked every inch a potential international venue. Great access and manageable facilities and, with current plans to advance its stature, this could prove a worthy venue for many future championships for both rod, pole and feeder disciplines. We mentioned on our day 1 galleries about the softness of the rod Will Raison was using. Here Mike Thinnes uses the same action rod, so as to not pull out of these hard fighting bream. We mentioned on our day 1 galleries about the softness of the rod Will Raison was using. 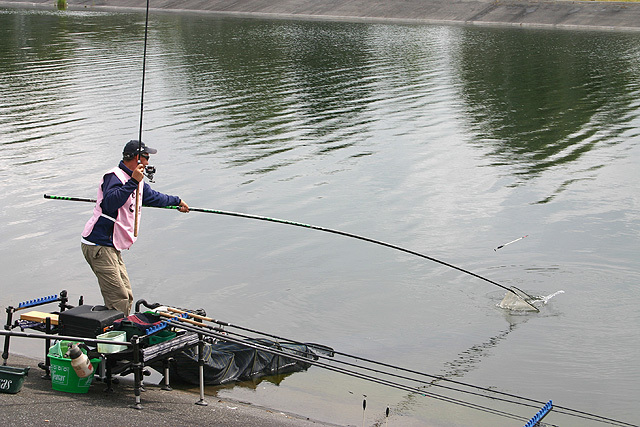 Here Mike Thinnes uses the same action rod, so as to not pull out of these hard fighting bream. and here is the peacock stemmed variety. Both where used successfully in Mike superb winning weight over the two days of 28,294 kilos. and here is the peacock stemmed variety. Both where used successfully in Mike superb winning weight over the two days of 28,294 kilos. Just one of the bonus bream from Mikes day 1 section 2nd placed weight of 12,980kgs. Just one of the bonus bream from Mikes day 1 section 2nd placed weight of 12,980kgs. 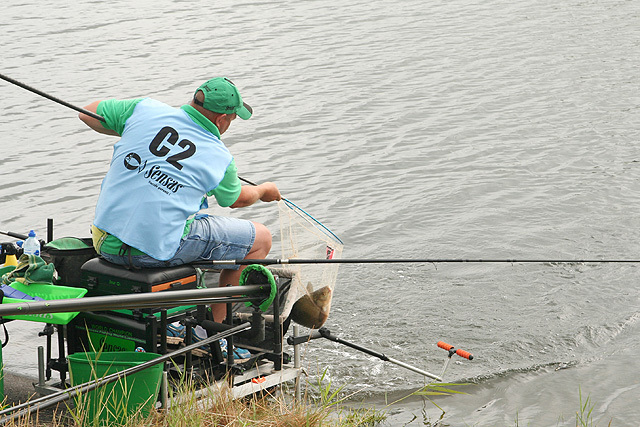 Mike found himself on C2 for the final day, a peg that had won the section on day one. I reckon he ran to his peg when he found out! 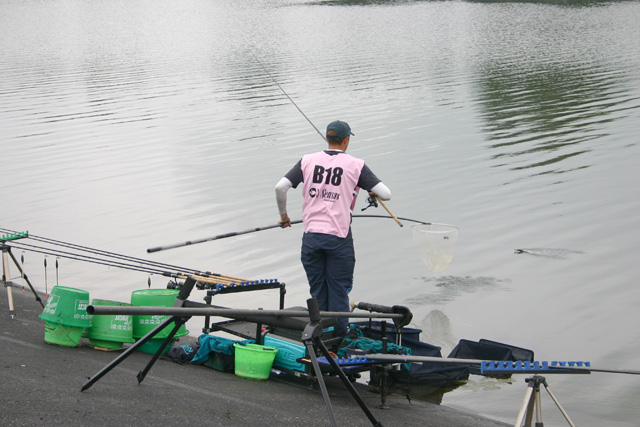 Mike found himself on C2 for the final day, a peg that had won the section on day one. I reckon he ran to his peg when he found out! This was one of seven big bream that almost doubled the first days winning weight, and it gave Mike the section and Championship crown. This was one of seven big bream that almost doubled the first days winning weight, and it gave Mike the section and Championship crown. Mike with the spoils of victory, who seems to have been joined by some 'gatecrasher' during his moment of glory!!! Mike with the spoils of victory, who seems to have been joined by some 'gatecrasher' during his moment of glory!!! Big Mike from Little Luxembourg! A final mention goes to Luxembourg’s Mike Thinnes, a well travelled and experienced team member who, over the weekend, reaped some glory for all those hard years of competition. He certainly found fortune over the two days and made it pay handsomely. Congratulations to him and the other individual medallists, Frenchman Diego Da Silva and Roman Pokorny Jnr, (Czech Rep.). My final, final comments must be directed to Denmark’s Peter Larsen who, at the last minute, stepped forward and became my second cameraman. Without him my photo coverage of the championships would have been 50% down. Many thanks Peter for your help, I hear Croatian beer is quite nice!